Do your kids know the value of a dollar? My daughter used to ask for something EVERY.SINGLE.TIME. we went to the store. When she was 3 we had a big blowout in the middle of Target when she screamed for the rest of the shopping trip (about 20 minutes) because I wouldn’t buy her something. People were staring, and I was ashamed and humiliated, but I didn’t budge. I stuck to my guns and didn’t buy her a single thing that day. Afterwards we discussed why she wasn’t getting a toy and at that time, she seemed to understand it slightly. As she has grown she now understands that sometimes we just don’t have the money to buy ALL THE THINGS we want. Since she started kindergarten she has learned to count to 100 but they still haven’t really introduced the idea of counting money. She’ll turn 6 this summer and I decide if she can count, she is old enough to count money. I know this will only add to her understanding of it all and hope that when she does, she’ll really get the value of a dollar versus just understanding that we can’t spend it whenever we want. 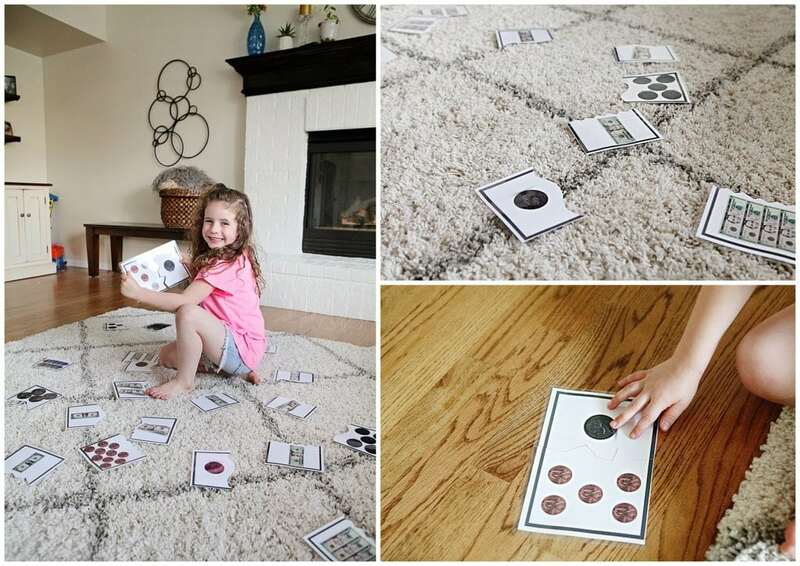 To help I’ve created a fun game for her to show her how money adds up. When I brought it home she saw it on the table and immediately asked to play with it. She had no idea what it was, but it looked fun enough that it was interesting to her and that made me happy. There are two ways you can use this game. 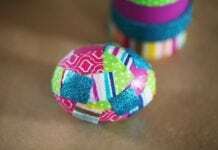 You can cut them in half in various zig zags and make a puzzle out of them. This is what we did, and this was my intention in creating the game. But you can also use them as flash cards to help you explain that five pennies equal a nickel, two nickels equal a dime and so on. My daughter has been really getting into puzzles and I love watching her mind work as she fits pieces together. 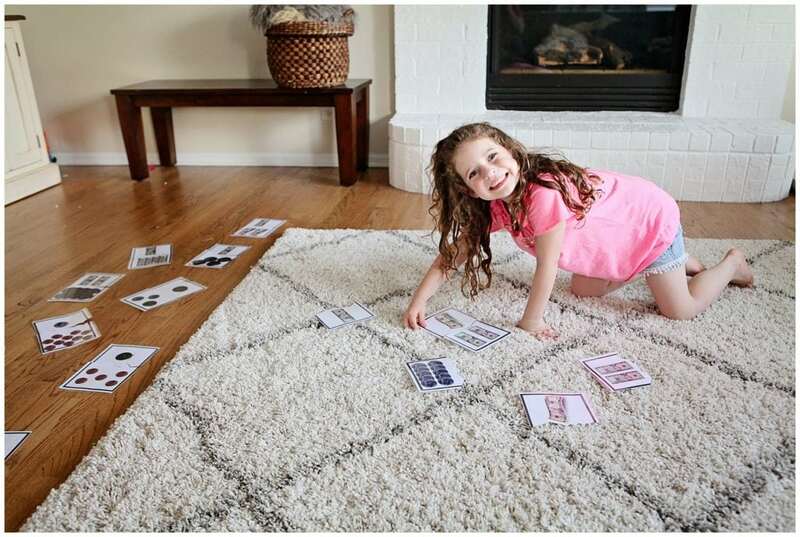 Cutting these printables apart so that they can be a puzzle for her was a great way to engage her. Once she joined the pieces together I was able to talk to her about why and how those pieces fit together and explain that the money on the right added up to the money on the left – even though they looked very different in some cases. I laminated the game, which I would recommend so you can use it again and again. I was able to get this done at the UPS store for just a couple of dollars and to me, it was worth it. Grab your FREE Dollars & Cents Puzzle Game in the For Kids section of the Printables Page. 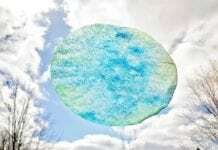 For more kid activities, click here. What a great way for the kids to learn how money works. My youngest is 10 and STILL gets his silver coins mixed up (mostly nickles and quarters). This is definitely something that every kid should do. My kiddo now knows the value of some money but I think if I had something like this it would have taught him at a much earlier age. Teaching kids the value of a dollar is so so so important so if/when I have kids, I will make sure to utilize this game! This would be perfect for my son. He is struggling with money. That looks like a great way to teach kids about money and make it fun. Every person should know how to handle money, and this is an excellent way of getting it started. My daughter is currently learning about money at school, so this would be a great game for her! I love when brands make learning fun! 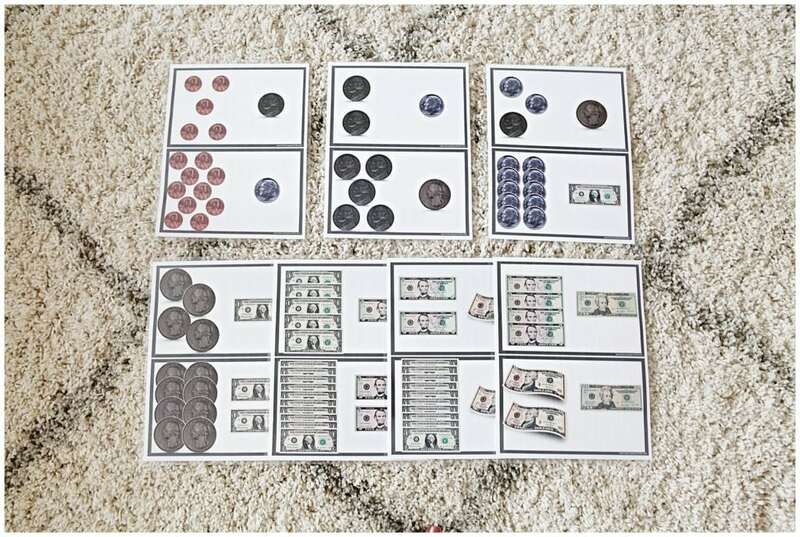 This is a great way for kids to learn about money and have fun at the same time. It is important to teach kids early about the value of money. This would be excellent for my son and daughter. My daughter is having a hard time with comprehension so making a game out of it would be exciting! I think this would be a wonderful game. Both my daughters are learning about money and this could really help them. They’re both doing very well, but I think this would be more fun. What an awesome idea! My oldest will be starting Kindergarten this year, so I’ll have to try this out with him as well. My son is about her age and would love this. He is kind of all about counting his “cents” these days, ha ha. I’m definitely using this, this summer. My younger kids still get their change mixed up. Oh I love this idea! We’ve had similar conversations with our 4yo. I think they just see us swipe cards instead of using cash (usually) so the concept of money is even more confusing. This looks like a great way for them to visualize it. My kids need this . They think money grows on trees. This sounds like a fun game to try with the kids. A great way to teach them about money. I agree with you…if they’re old enough to count to 100, then it’s time for them to begin learning the basics about money. This looks like a great teaching method. And she looks so excited to play. Adorable! It’s good to keep kids in control of what they want because if it was for them, they want everything. My mom used to tell me that when I was younger. This looks fantastic! My youngest daughter would really enjoy playing this game with her big sister. What a fun way to make learning about money a great experience! 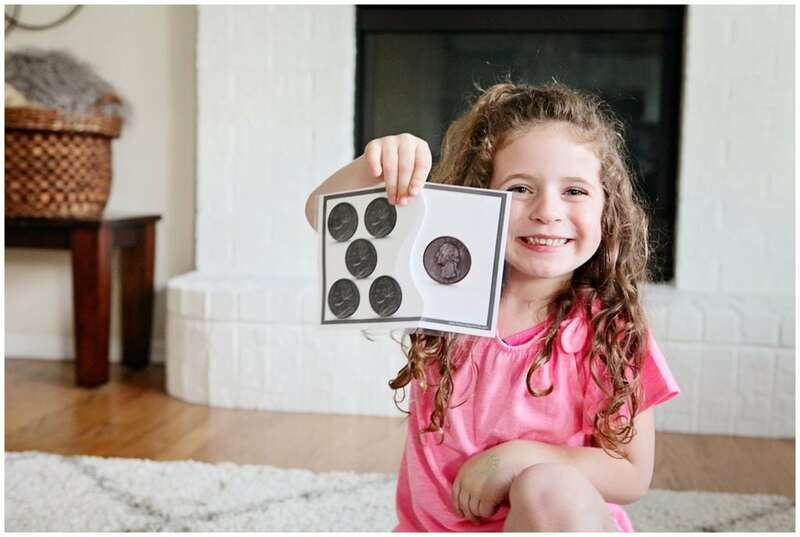 Teaching kiddos about money and how to use it properly is so important! I give in too much to buying them stuff that they ask for. Not my best work. This is a great idea to start with her at this age. She’ll have a leg up for the next school year! That’s actually a pretty brilliant way to help the kids understand money better. I love the fact that the pieces on the left are equal to the ones on the right. It’s a lot of fun for them too! Love the simplicity of this game! Teaching kids early on about money is important! This is too cute! Our girls love learning about money when we shop. This might come in handy when we start planning our summer lessons. 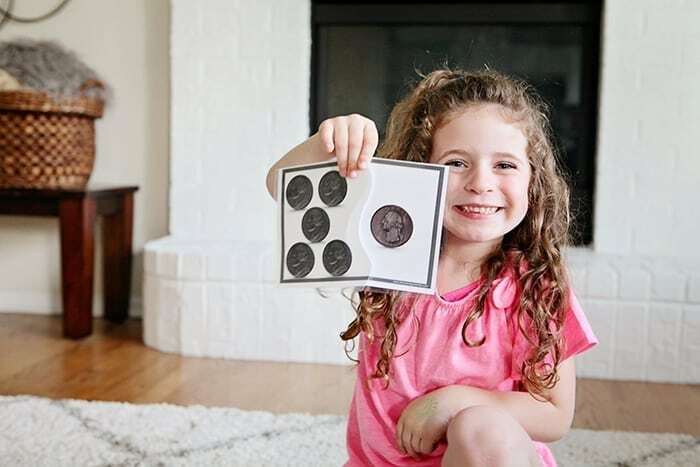 Super cute way to help kids learn about money. Laminating them is a great idea to be able to use the cards over and over. Now this is my kind of game for kids! Teaching them about money while having fun is a great idea. Laminating the sheets was a great tip. It’s so important to teach kids about money! This is a really cute idea for homeschooling! (and regular school, lets face it lol). My son is 4 and already learning about his coins by having a savings jar. He loves collecting the coins, telling me what he has, and depositing them. It’s so important for kids to learn about money. This is a great idea, and it makes learning fun too. Thanks for sharing, it’s good to have educational ideas. This is such a great idea. 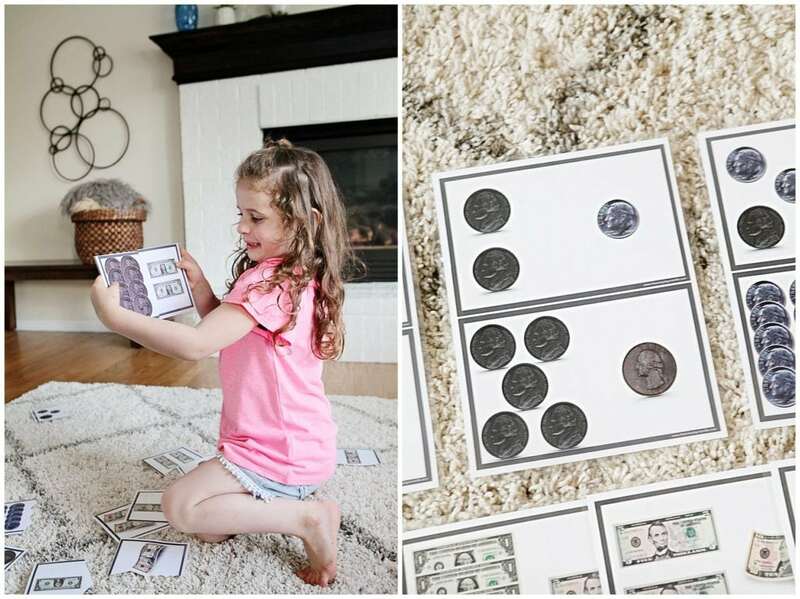 I love anything that teaches my kids about math and money!